Hatebreed has announced the second leg of their 25th Anniversary Tour with a bunch of tour dates. The first part of the tour will be with Obituary, Cro-Mags, Terror and Fit For An Autopsy for most dates. 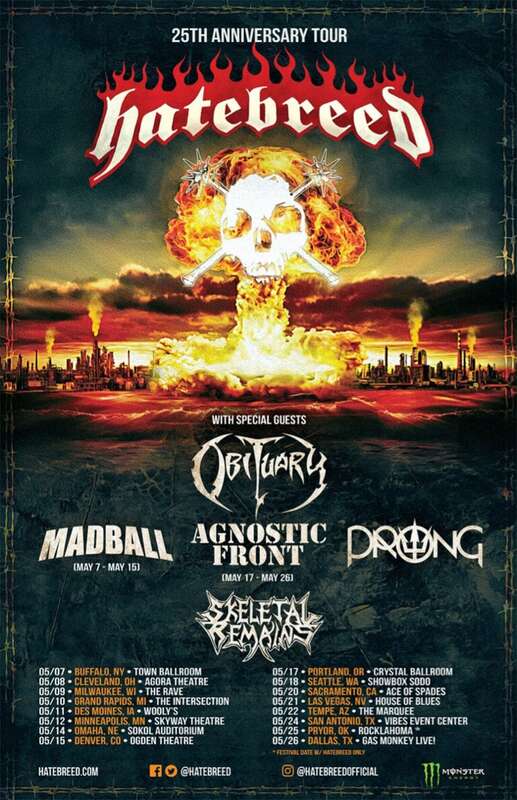 Then the next part will be with Obituary, Madball, Prong and Skeletal Remains and the last leg will be Obituary, Agnostic Front, Prong and Skeletal Remains. On April 19th, the first part will be at Playstation Theater in NYC. I can’t believe it’s been 25 years already, We’re excited to bring out this massive tour package with some of our favorite bands. Every band on this bill is a headliner in their own right. The show will be run festival-style with bands you don’t want to miss playing early. Activate the pit! There’s something special about being able to take out bands who influenced your own band. This is the kind of stuff you dream about as a kid. We are truly honored to bring this package to everyone as part of our 25-year anniversary.